I first tried pickling red onions after seeing it done on Anne Burrell's fantastic show Secrets of a Restaurant Chef. If I recall correctly, they were just being used as a garnish. I never attempted to cook the full recipe from that episode, but I have since made pickled red onions at least a hundred times. The process is so simple and the are results amazing. I add pickled red onions to salads and tacos. On nights where I just want to eat cheese and charcuterie for dinner, I make sure I include something pickled. I even cook them in one of my go to pasta dishes, so stayed tuned for that! If your eyes start to water while slicing the onion, stick your head in the freezer. Take a few deep breathes through your nose. I don't know why it works but it does. Slice the onion in half through the root. Lay each half cut side down and slice the tip of the onion that is opposite the root. Then remove the skin and peel off the outermost layer of the onion. Starting at the cut end, thinly slice the onion into half moons as you work your way towards the root end. Add the red wine vinegar, water, salt and sugar into a bowl. Whisk until the salt and sugar has dissolved. 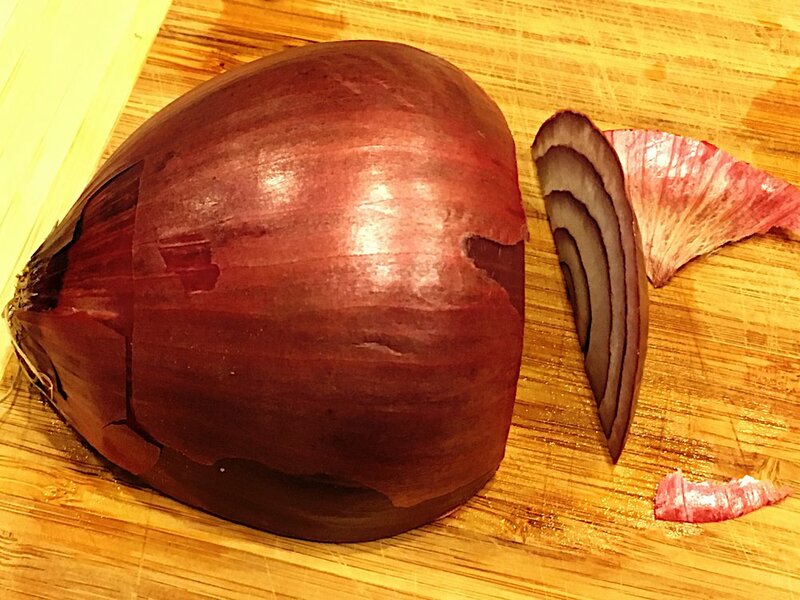 Break the onion slices apart and into a container that has a lid. Pour the pickling liquid over the onions. Press down the onions into the liquid. It is okay if all slices are not fully submerged. Leave uncovered on the counter for 10 minutes. After 10 minutes, you should be able to press the onions down and submerge them in the pickling liquid. Put the lid on and refrigerate. Enjoy now or over the next two weeks. They will get "more pickled" over time.